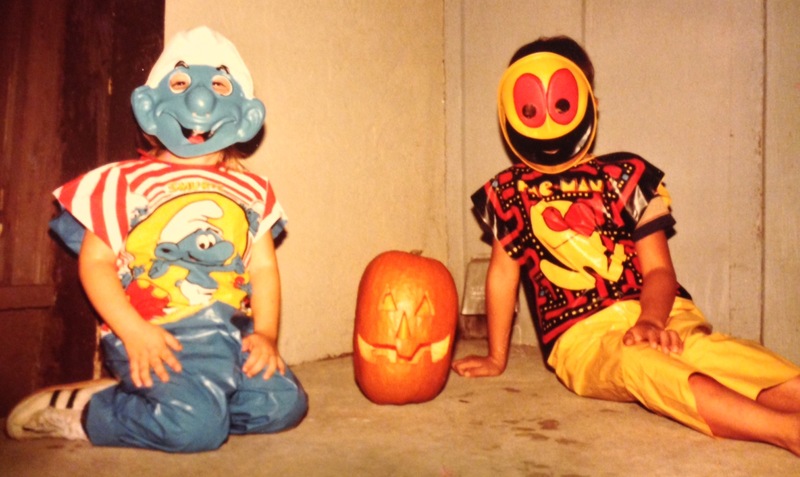 #tbt, Part 3: Halloween Edition! 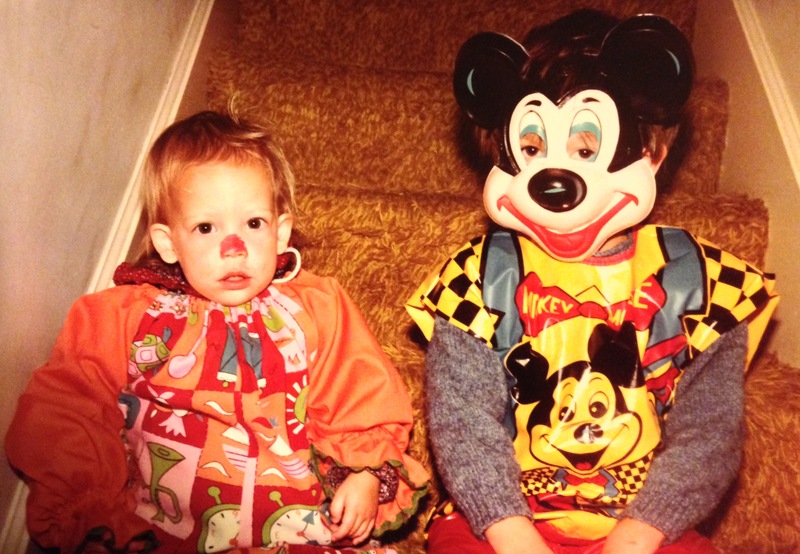 If this picture is any indication, I wasn’t all that into Halloween that year (you wouldn’t be, either, if your introduction to Halloween included that horrifyingly scary Mickey Mouse costume). But, as I got a little older, I became a huge fan of Halloween. Halloween was a big deal in my house. Normally, my brother and I were allowed only one item of candy per week, which was officially dubbed “Saturday Candy.” Halloween was the one exception. 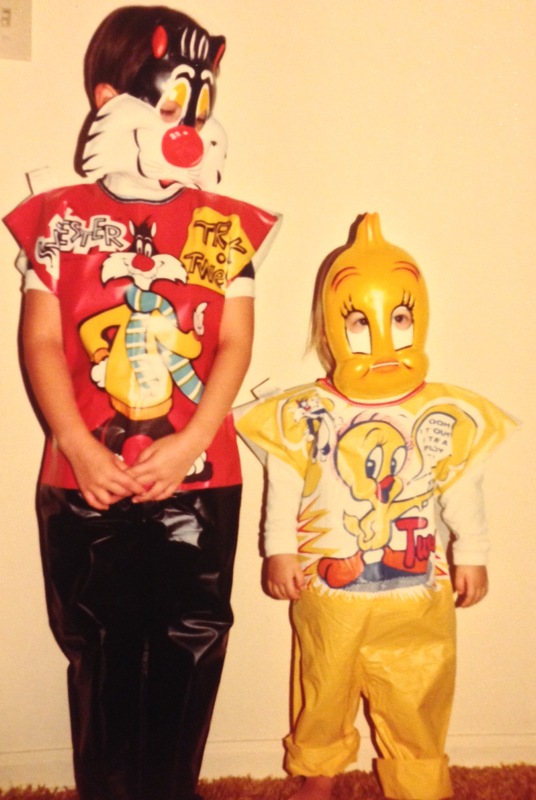 My mom would take us trick-or-treating for hours (while Dad manned the door at home). We would dump our haul on the living-room floor and gorge ourselves on as much as we wanted. Candy, candy, candy, candy, CANDY!!! I was absurdly small. Mom probably could have cut the pants off . . . but, instead, she just rolled them up (unevenly and ridiculously). One year later; twice as big. In addition to the janky costumes and the piles of candy, I loved Halloween for its theme books! Holiday books are great, great, great! I am not (and never was) a huge fan of the truly scary, but I can get behind the creepy and spooky. The Witches is not a book that has to be enjoyed exclusively around Halloween, but it’s definitely Halloween appropriate. 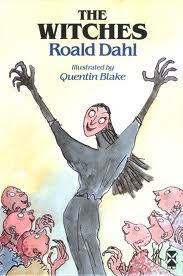 Roald Dahl is the master of wicked/creepy fun. And witches are quintessentially Halloween. The Witches teaches us that there are disguised witches all around us. They hide their gross bald heads in “first-class wigs” and stuff their disgusting feet into normal shoes. I am not, of course, telling you for one second that your teacher actually is a witch. All I am saying is that she might be one. It is most unlikely. But–here comes the big “but”–not impossible. 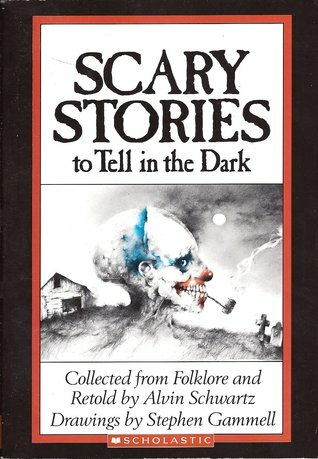 Scary Stories to Tell in the Dark (along with More Scary Stories to Tell in the Dark and Scary Stories 3: More Tales to Chill Your Bones) are super creepy, short tales perfect for Halloween. This book series (along with another of my childhood faves, Goosebumps) is on the lists of the 100 most frequently banned and challenged books from 1990-1999 and from 2000-2009. But it’s in good company—Harry Potter, I Know Why the Caged Bird Sings, To Kill a Mockingbird, The Bluest Eye, and A Wrinkle in Time are all also on the lists. Seems like a pretty good to-read list to me! I’ve talked about my love of the Berenstain Bears before (here). 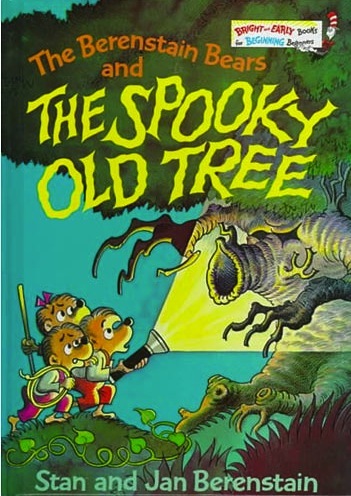 This is one of the first Berenstain Bears books we had. This book is from the era before Stan & Jan really got into a groove (with the beginning rhymes and such), but it’s still a great one. I loved Arthur the Aardvark waaaay before he became a famous television star. 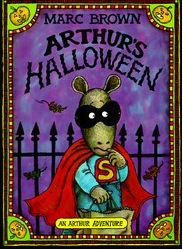 These days, Arthur is so huge he even has his own Halloween web page with masks and coloring pages and e-cards. In Arthur’s Halloween, Arthur is a little creeped-out by Halloween. And he is not particularly excited about having to take his sister, D.W., trick-or-treating . . . especially because D.W. insists on going to all the houses, even the scary house at the end of the street. Now, go, read some spooky, fun Halloween books, go trick-or-treating, and have a safe and wonderful Halloween! 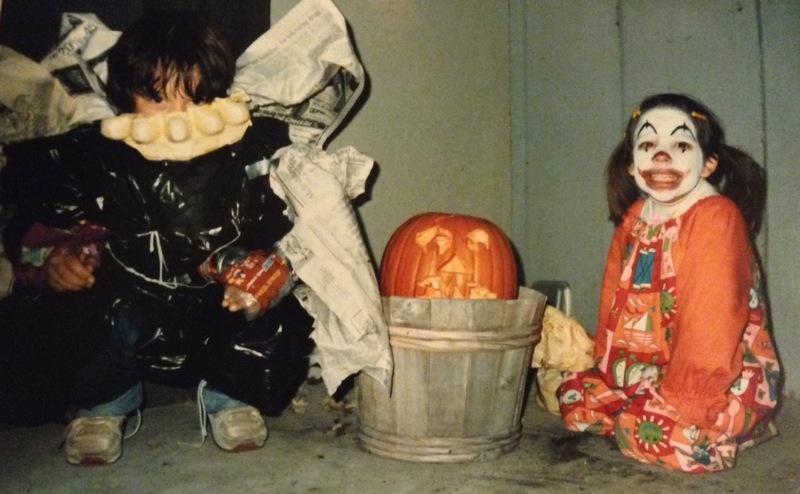 1985: John decided to make his own costume; he went as a bag of trash. Recognize my costume? Apparently, it still fit. 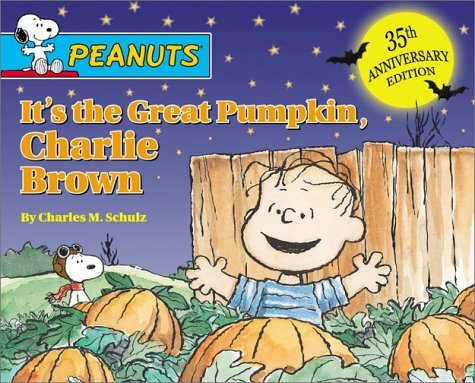 This entry was posted in Not a book review and tagged Arthur's Halloween, Berenstain Bears, Books, Children's Books, Halloween, Happy Halloween, It's the Great Pumpkin Charlie Brown, Scary Stories to Tell in the Dark, The Witches. Bookmark the permalink.